Following an amazing few days exploring the Ardennes and the Battle of the Bulge with our guide Michel, for our 5th and final day we were left to our own devices. 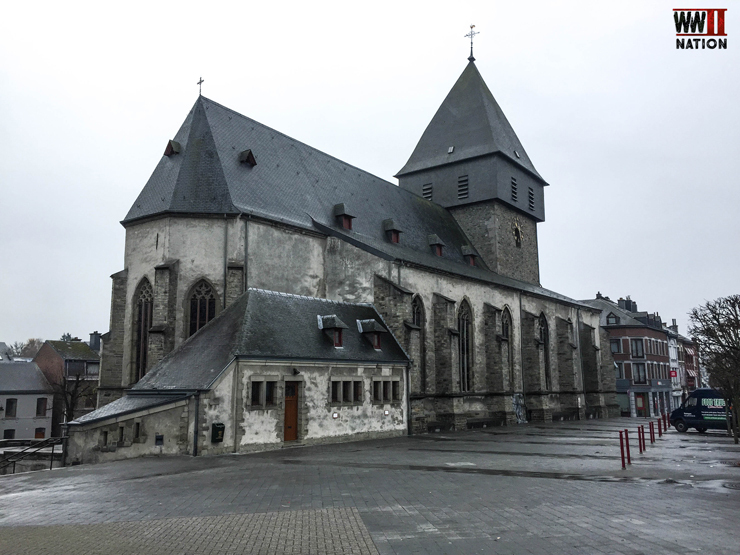 So, we decided to go on a tour of Bastogne and investigate a bit more of its history and try and find a few of those buildings connected with the siege of December 1944 – January 1945. 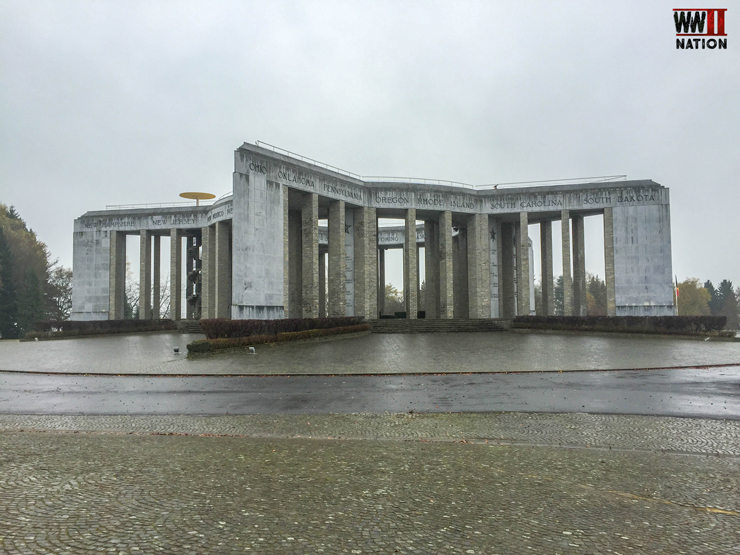 As well as this, we also follow the story of the Angel of Bastogne (which you can see in the 4th and final Vlog from this trip), we visit the Mardasson memorial which was dedicated to those American servicemen who became casualties during the Battle of the Bulge and we also get a personal tour of the remarkable Bastogne War Museum by curator Martin Cugnon. 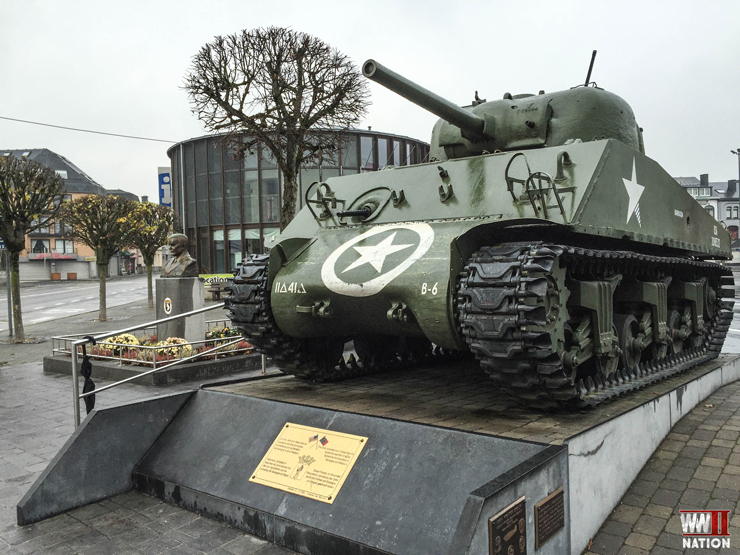 For those who missed our Day 4 Journal Post, where we explore the British role during the Battle of the Bulge and the 6th Airborne Division’s Battle at Bure – Click Here. 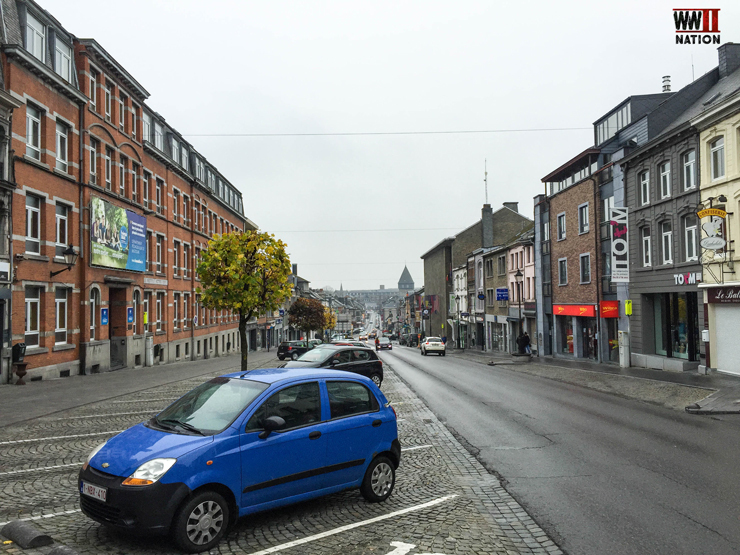 We started our final day tour off from the heart of the Bastogne in the town’s main square, which was fittingly later named after General Anthony McAuliffe. Situated here is a memorial to McAuliffe, the 101st Airborne Division and all those who fought here during the siege. 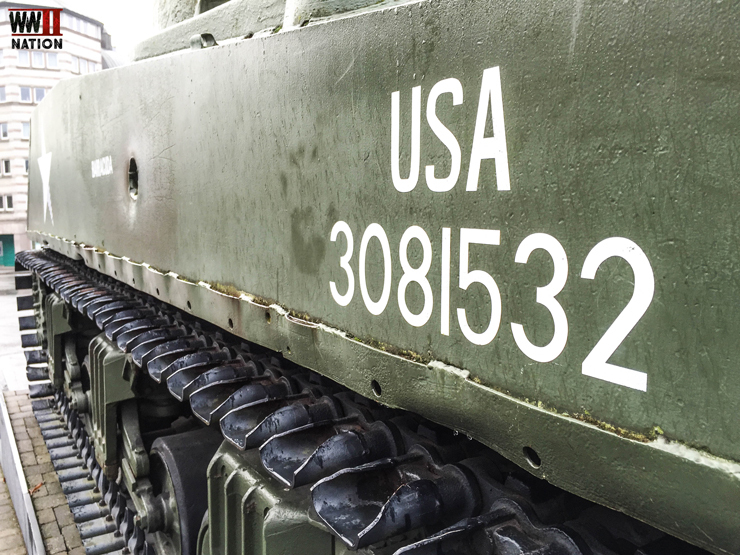 There is also a veteran from the Battle of the Bulge in the form of an American M4 A3 Sherman tank armed with a 75mm gun which bares the scares of the fierce fighting that took place here. Named Barracuda it is marked up as an 11th Armoured Division tank from the 41st Tank Battalion and was knocked out in December 1944. 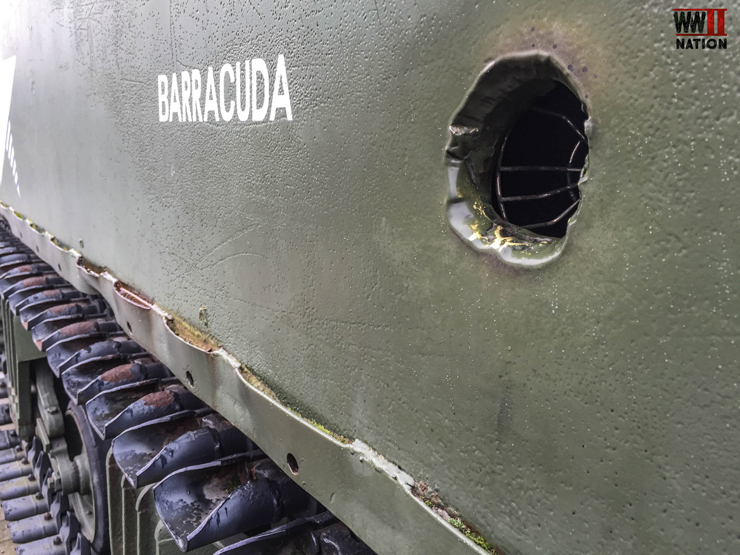 I have read and been told different stories about this particular tank and fully expected it to be called King Cobra based on my research, so I was slightly surprised to see Barracuda painted on the side. So I asked our guide about Michel about the tank’s history and story. Apparently it was one of the first tanks to break through into the perimeter and thus help lift the siege of Bastogne. 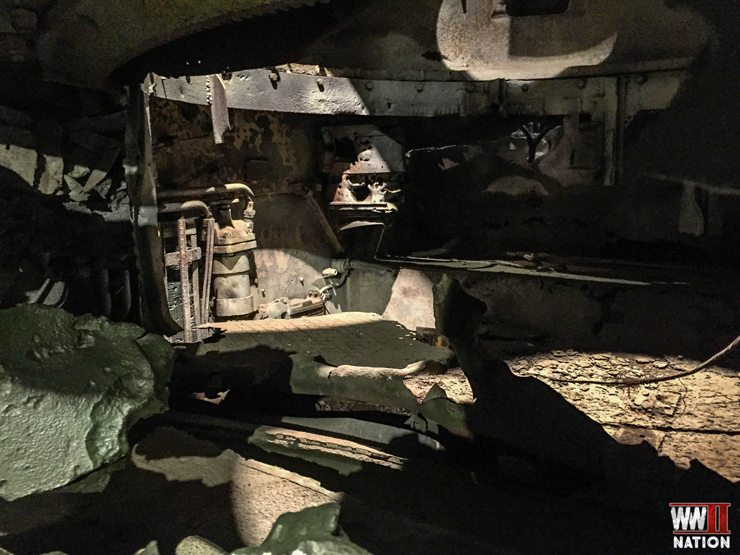 As you can see this Sherman suffered some heavy battle damage, according to our guide, the tank’s crew survived this encounter with German armour. Hit by an initial shell in the rear armour from a Panther Tank, the Sherman quickly tried to extricate itself out of danger and in doing so manage to manoeuvre down a slope and become stuck in a boggy ditch. 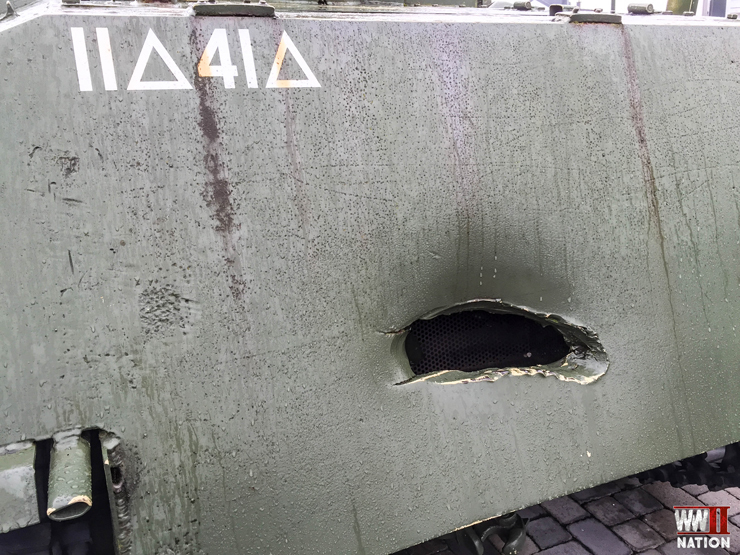 Not willing to risk waiting anymore the crew bailed out, just in time, as an armour piercing round went straight through the side of the tank. From the square we headed down the main road through Bastogne towards the Church of Saint-Pierre which you can just make out the clock-tower for in the background. 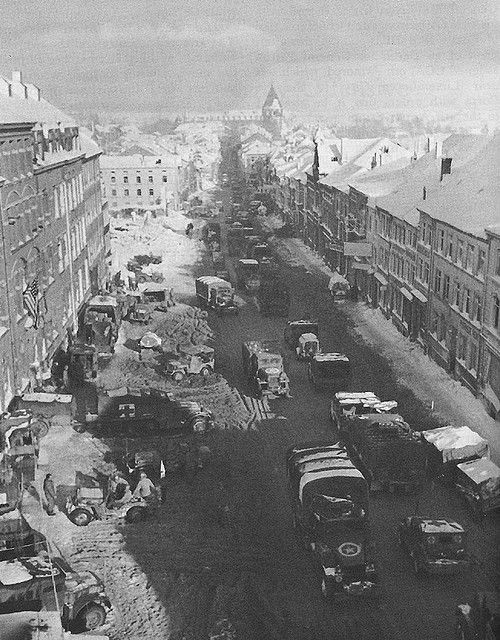 There is a famous photo (which I have linked to at the bottom of this post) of this road during the winter of 1944-45 where you can see American supplies being moved through the town by truck. Interestingly Michel kindly pointed out to us that despite Hollywood’s depiction of the church being used as an aid post by the 101st Airborne Division, it was not. In fact it was this red-brick building just on the left of this main highway through the town that was used by the 101st Airborne Division as one of their hospitals and aid-stations, another was located in the Heintz Barracks. Also in the archive photo I linked to below, you can see this red brick building with red-cross trucks and ambulances just outside. From here we moved down to the bottom of the road to visit the Church of Saint-Pierre, made famous to us by various scenes in HBO’s WW2 mini-series The Band of Brothers. 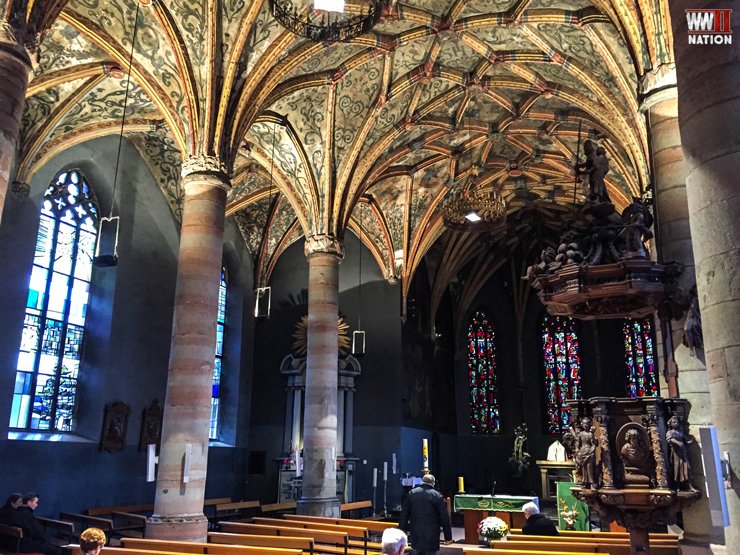 Apparently parts of it date all the way back to the 11th century, but most of its features are from the Gothic period of the 1500’s. This building was heavily damaged by the shelling during the siege and was caringly restored and renovated during the post-war period of the 1950’s. I have read that various troops used it as shelter during one stage or another, first I believe MPs of Troy Middleton’s VIII Corps stayed here before the siege. Then some of the men of Colonel Roberts 10th Armoured Division’s Combat Command B temporarily stayed here when they first arrived. 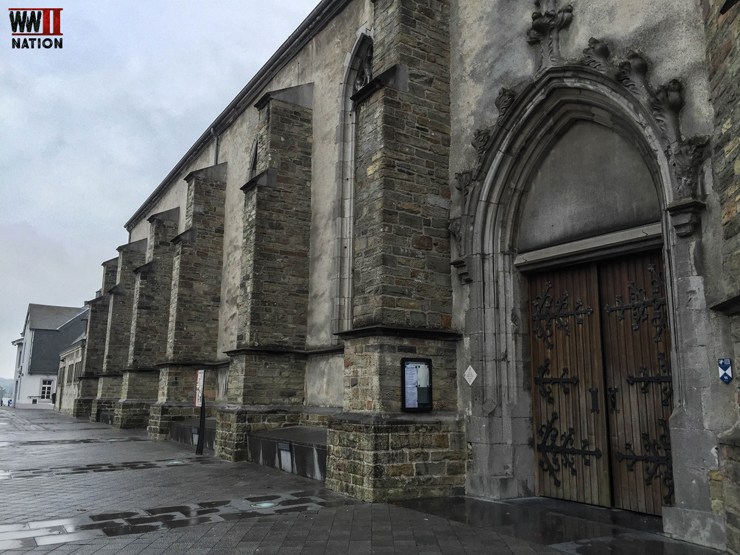 It was later during the siege that the Church was packed full at Christmas for a midnight mass service. Heading back up towards McAuliffe’s Square, just off this we took a look at the 101st Airborne Museum – sadly with a lack of time, we did not get a chance to look inside, but this is definitely somewhere I hope to visit on our return. 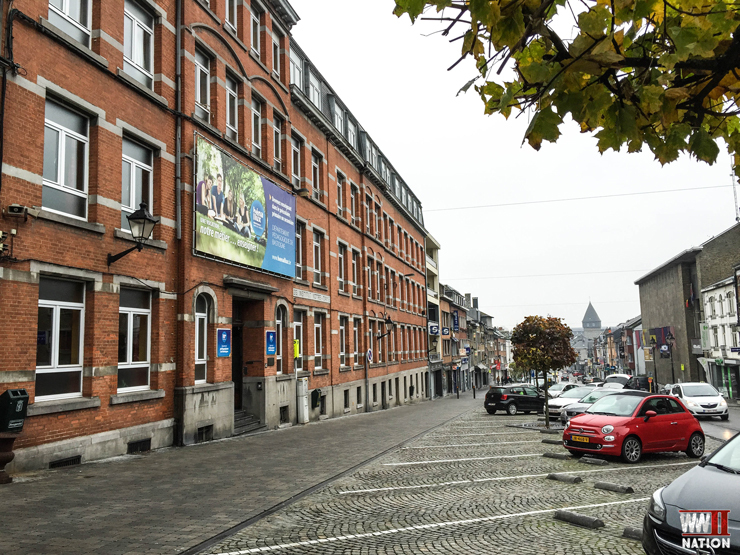 Built in 1936, the museum is interestingly housed inside the formers officers’ mess of the Belgium Army which was then used by the Germans during their occupation of Bastogne. From here we stopped off at the former Headquarters of Colonel Roberts during the siege of Bastogne. Commander of Combat Command B of the US 10th Armoured Division, his armoured unit was the first combat reinforcements to reach Bastogne, arriving on the 18th December 1944. Originally this building was the Hotel LeBrun when Roberts choose to house his CP here, it was since the White House Restaurant and Hotel, and today is flats and a swimming pool, spas and saunas shop. We then started focusing in to look at the story of the Angle of Bastogne, Belgium nurse Renee Lemaire. 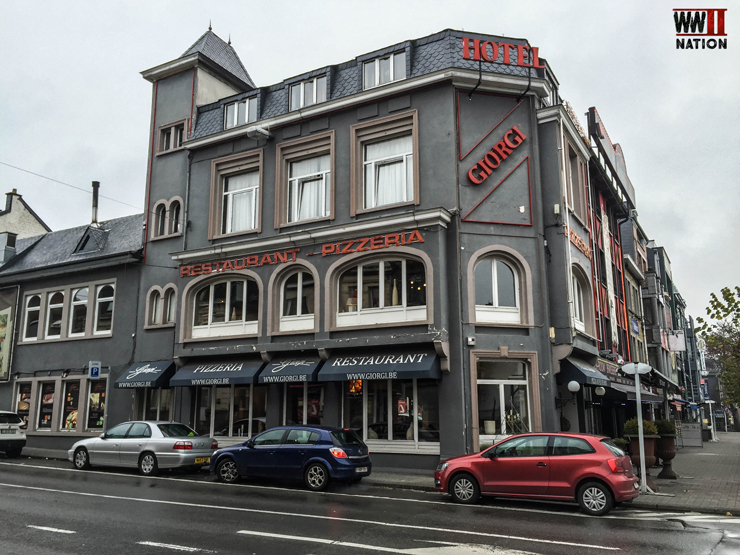 As almost right next door to Colonel Roberts CP and sitting just on the main town square is today Giorgi Restaurant and Pizzeria. 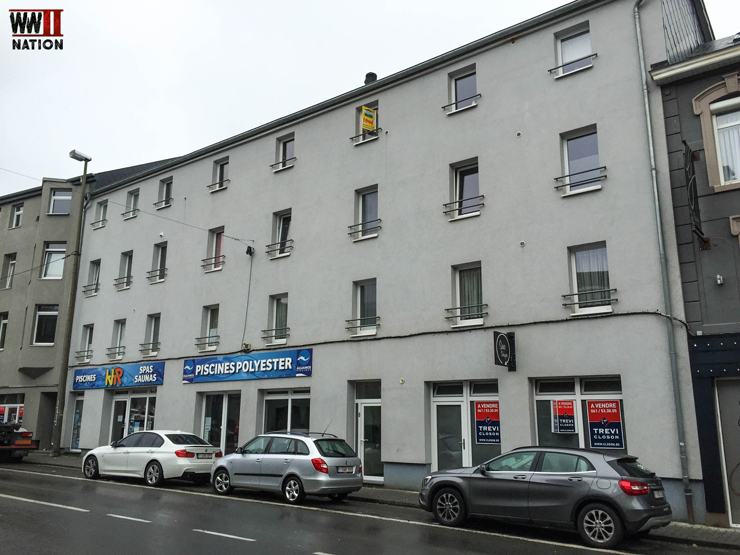 But this building was once the family home of Renee Lemaire and this was where her parents had a hardware store. I have linked to another archive photo at the bottom of this post, where you can actually see this building in the background during the Siege, the square is to the right. Again Renee’s incredibly story and role during the sieged of Bastogne was made famous during the Band of Brothers series. However as we shall see in the final day Vlog, there are a few differences to the reality. 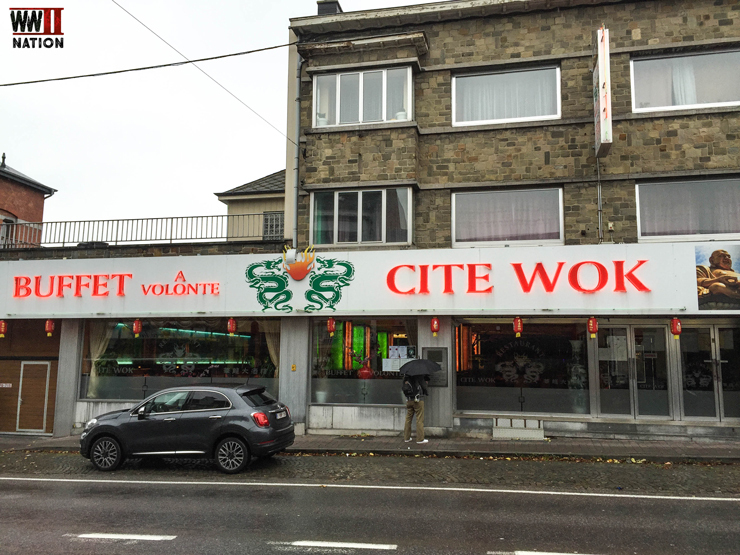 It was here where today the Cite Wok Chinese Restaurant is located that back in December 1944 this building was used as an aid post of Colonel Roberts’ 20th Armoured Infantry Battalion, 10th Armoured Division and where Renee Lemaire trapped inside the besieged town, volunteered as a nurse to assist these wounded men. 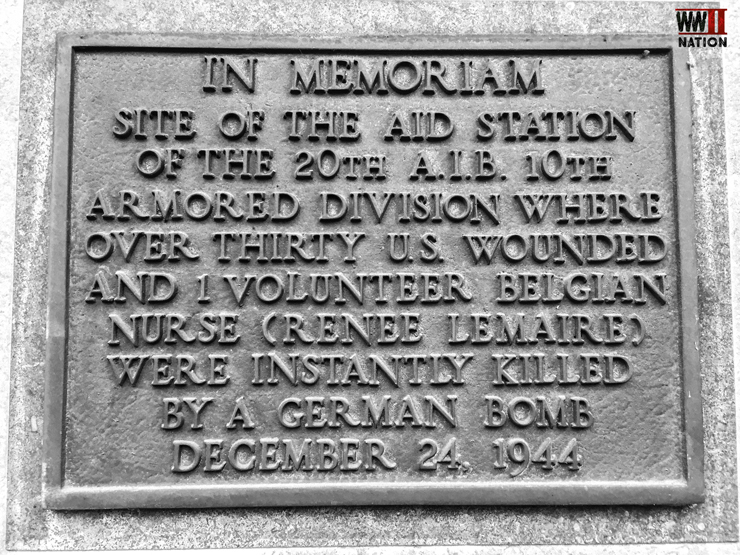 Sadly as denoted by this memorial plaque on the side of the Restaurant commemorating these events, on the night of the 24th December 1944 during a German air-raid the 10th Armoured Division’s Aid post was hit by a German bomb killed 34 of the wounded US servicemen inside. Renee managed to save a few, pulling them from the burning building, unfortunately though on her final return trip inside she never made it back out. Born in the year that heralded the start of the First World War, Renee sadly died aged just thirty. Today she is buried alongside the rest of her family at the Bastogne Cemetery opposite the Heintz Barracks. 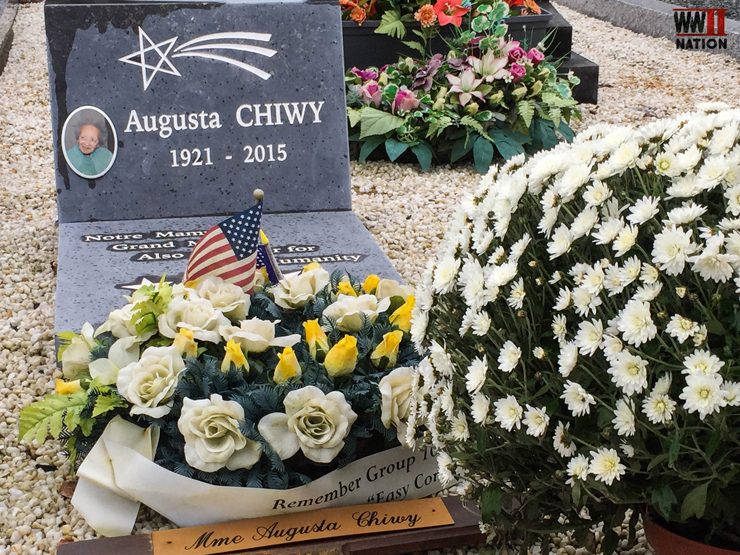 It was not just Renee though who volunteered to help the wounded from the fighting during the siege of Bastogne, her friend, a nurse from Congo, Augusta Chiwy also assisted in taking care of the American wounded. However she was not on duty on the night of 24th December 1944. She lived a long life, passing in 2015 and is today buried in the same cemetery as her friend Renee. Both Renee and Augusta were awarded the medal of the Knights in the Order of the Crown by the King of Belgium for their actions during the war; both of these are on display at the Heintz Barracks. The Mardasson Memorial a large star-shaped memorial built atop Mardasson Hill just on the outskirts of Bastogne, commemorates the 76,890 American soldiers killed, wounded or missing in the Battle of the Bulge. Inaugurated on 16th July 1950, General Anthony McAuliffe was present for this dedication – I believe there is also archive newsreel footage from this event. 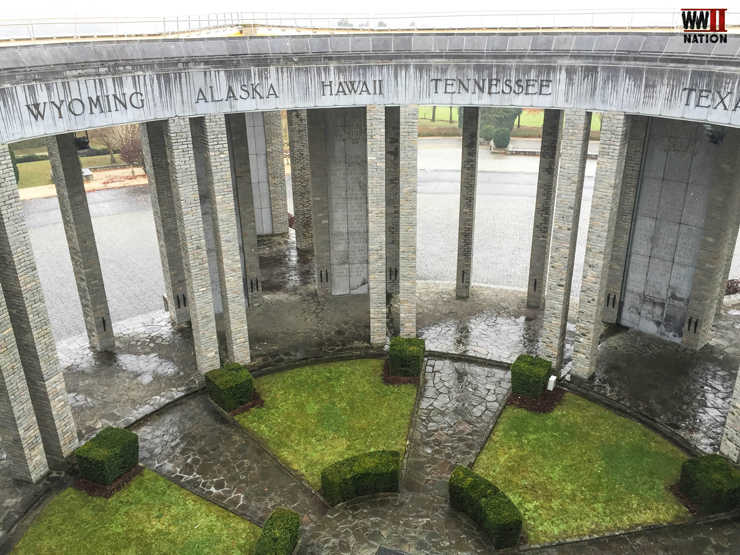 Mardasson Memorial lists all the American states that these men who fought and were wounded or killed came from as well as every U.S. unit that these men served with during the Battle of the Bulge. Interestingly, it is believed that it was here atop Mardasson Hill that on the 19th December that the Germans manage to make it closest to the town of Bastogne during the siege. One German was killed here when their patrol encountered the American defenders. Right next door to the Mardasson Memorial is the Bastogne War Museum. It was here we met up with one of the curators of this fascinating museum – Martin Cugnon –who kindly gave us a tour, telling us about a few of the personal stories behind the exhibits. 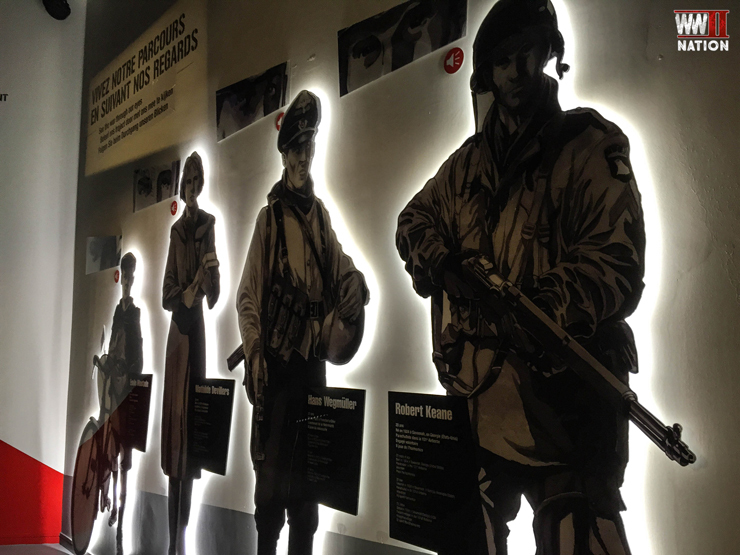 The museum is built around an interactive experience whereby you follow the stories of 4 individuals caught up in the Battle of the Bulge and the siege of Bastogne and whose paths all ultimately come to cross one another. 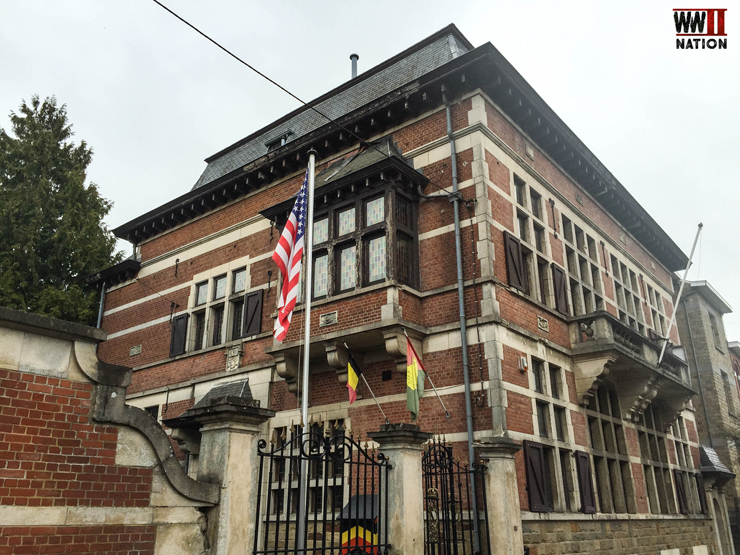 It provides the visitor with views of this historical event, from the point of two Belgian civilians, one a child and one an adult, as well as a German and American soldier. 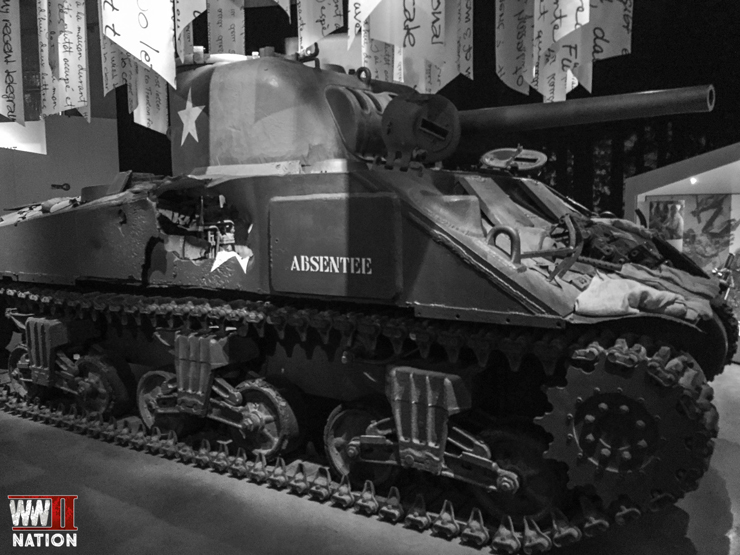 As you would probably expect, there is a lot of armour on display in the museum including this veteran Sherman Tank – Blockbuster – which stands waiting to welcome you on your way into the Museum. 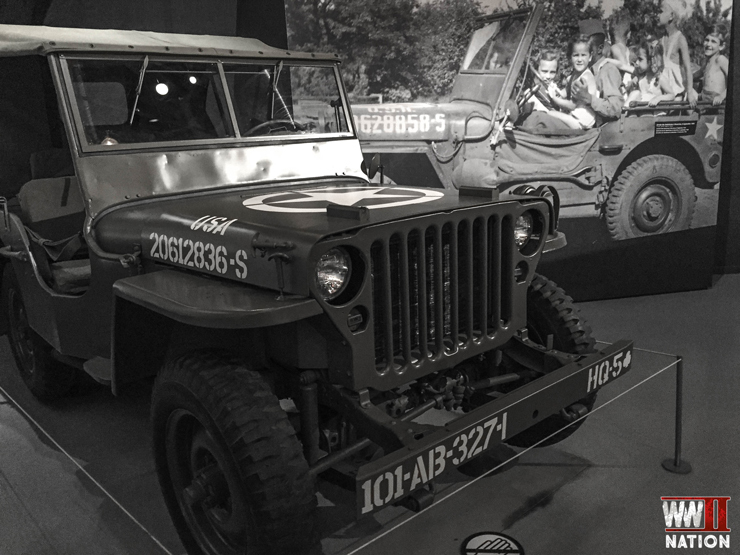 The photograph behind this WW2 American Jeep is also a fascinating story as it turns out it was one of Martin’s relatives who was photographed here as a child going for a ride with the American servicemen when they arrived in the area. According to the plaque this was in September 1944, but they have recently discovered that it was in fact taken later, in May 1945. An often overlooked aspect of the Battle of the Bulge is the aerial battles and campaign fought in the skies above the Ardennes and Luxembourg during that winter. Both the RAF, USAAF and Luftwaffe fully pitted themselves into this battle. 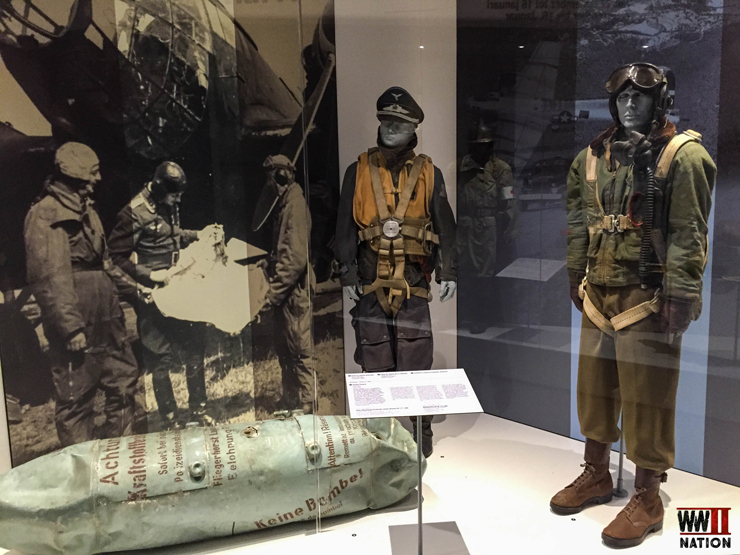 As well as Operation Bodenplatte, bombing raids as well as night-fighter and night-bomber activity and even re-supply drops were carried out by both sides. In this exhibit you can see an example of an original German aerial supply canister, similar to those dropped by the Luftwaffe in their re-supply attempts to Kamfgruppe Peiper around La Gleize. 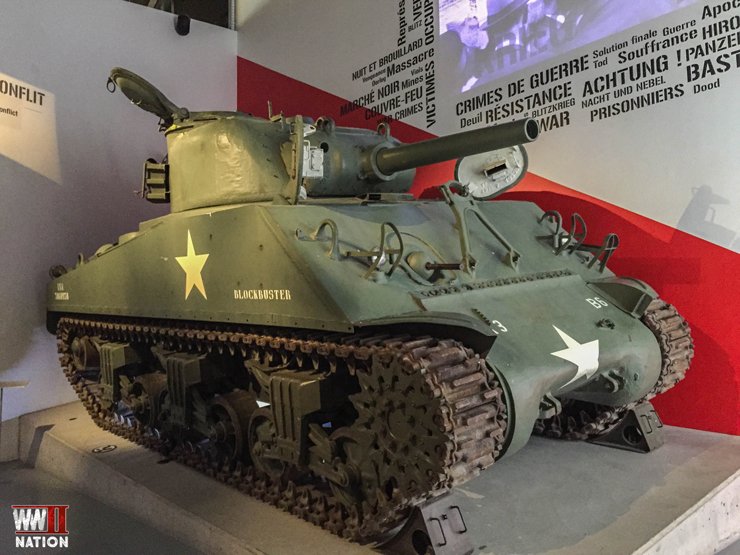 This M4 A4 Sherman Tank ‘Absentee’ in the heart of the museum, we were told was apparently in service with the British, apparently most M4 A4 versions were issued by the U.S. to the British during World War Two. As you can clearly see this particular model had certainly seen better days. A direct hit, side on, into the crew’s fighting compartment. There is also a Jagdpanzer 38(t) Hetzer which was sold by the Czech Government to the Swiss Army back in 1948. 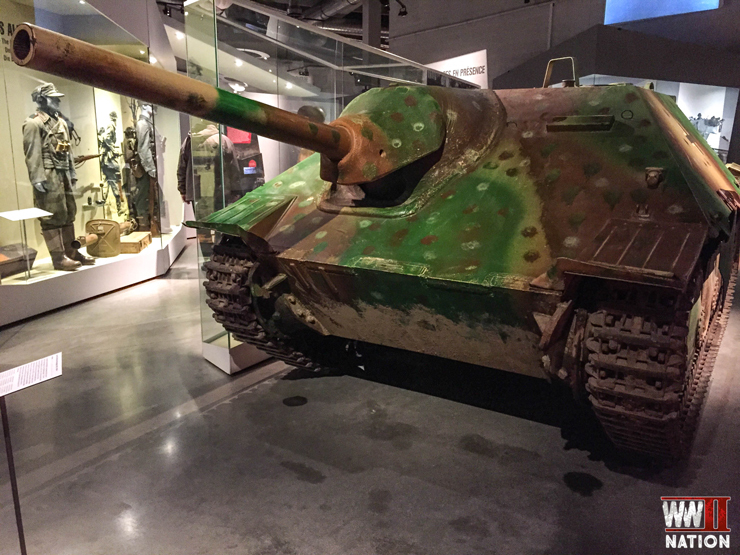 It was eventually bought from the Swiss, re-camouflaged in the 26th Volksgrenadier Division’s colours, who played a key role in encircling Bastogne and its subsequent siege. 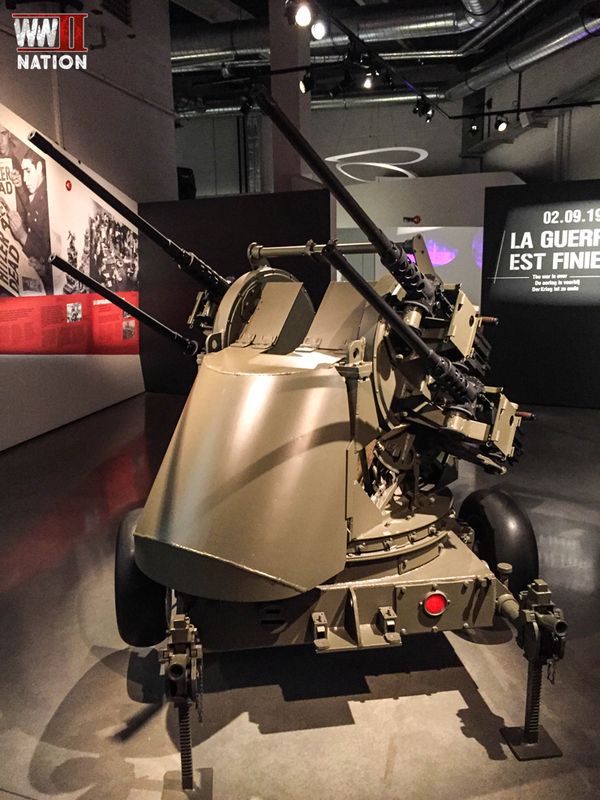 The Division had started the offensive with 14 of these Hetzers. There are a few really interesting exhibits that caught my eye. 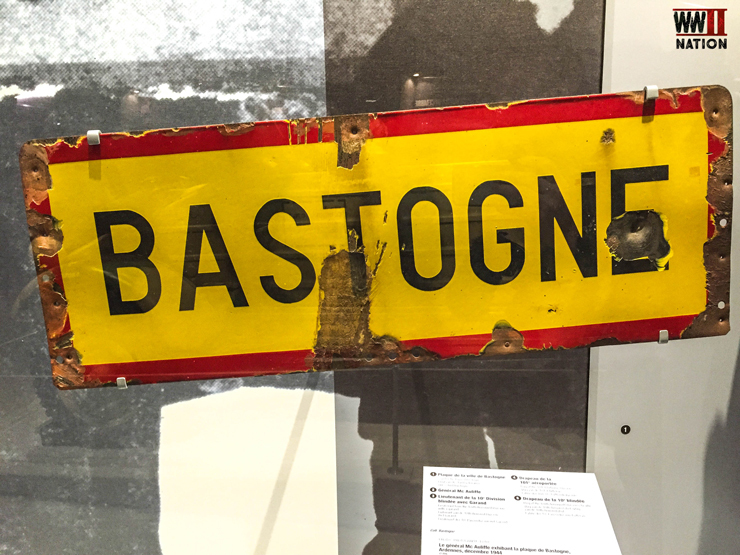 There were 7 roads into the town of Bastogne and this is one of the original Bastogne road signs from the siege. This particular sign was taken as a souvenir in 1945 by Captain Bernard Jacobson who donated it to the War Museum back in September 1976. 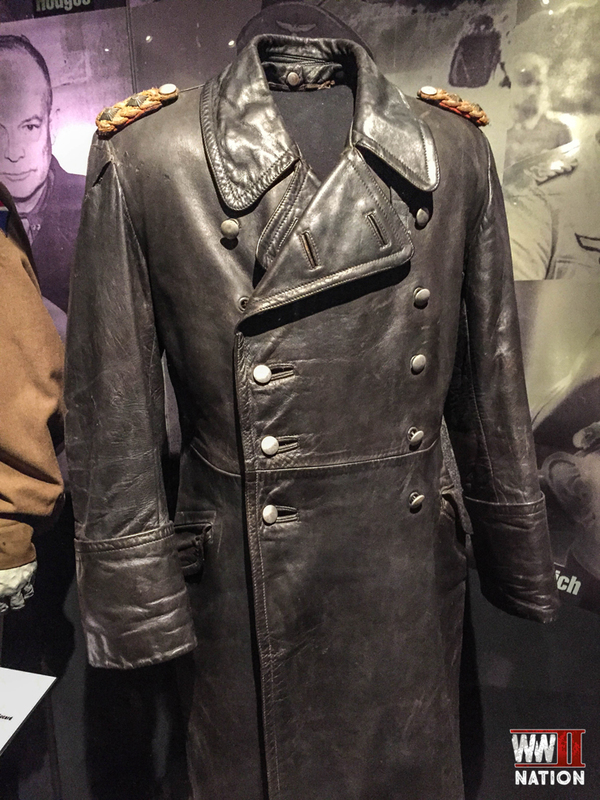 As well as this, there is the original leather jacket of General Hasso-Eccard von Manteuffel, commander of the 5th Panzer Army. 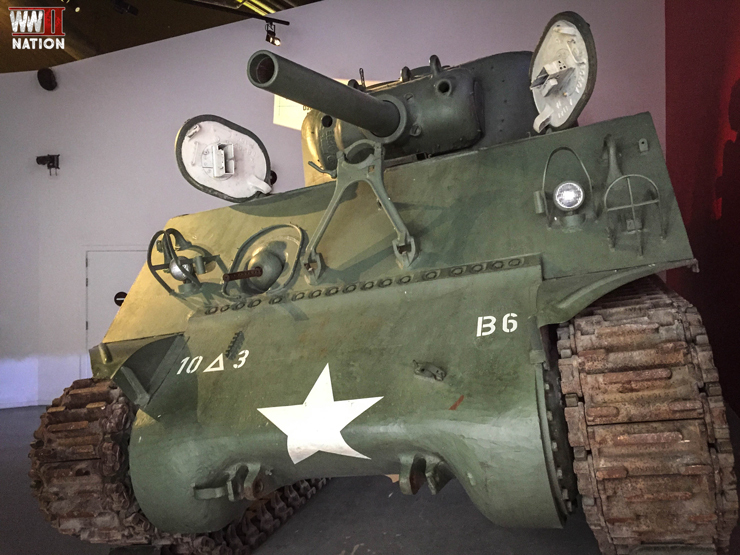 This is the exact one he used during the Battle of the Bulge and which he donated to the museum after the war. 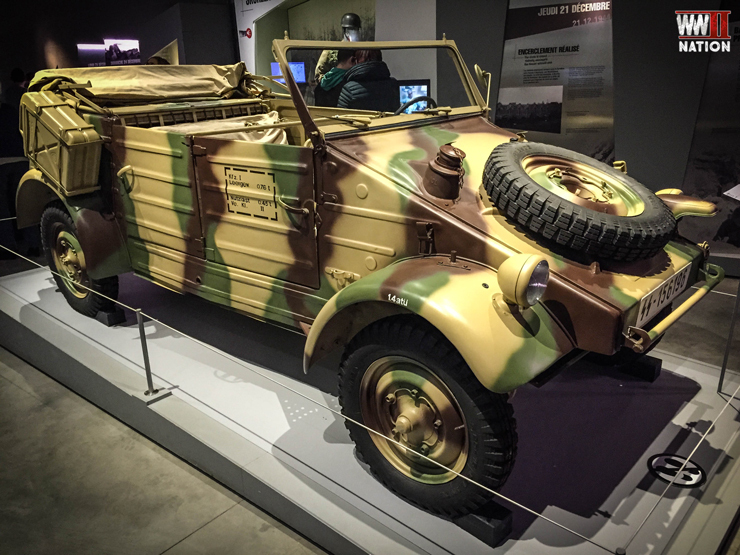 It was great to see another Volkswagen Kubelwagen, this time fully assembled, having seen the one previously at Bastogne Barracks undergoing restoration. Around 50,000 of these were produced for the Germany Army during the Second World War. This was an interesting final symbolic exhibit and very thought provoking. 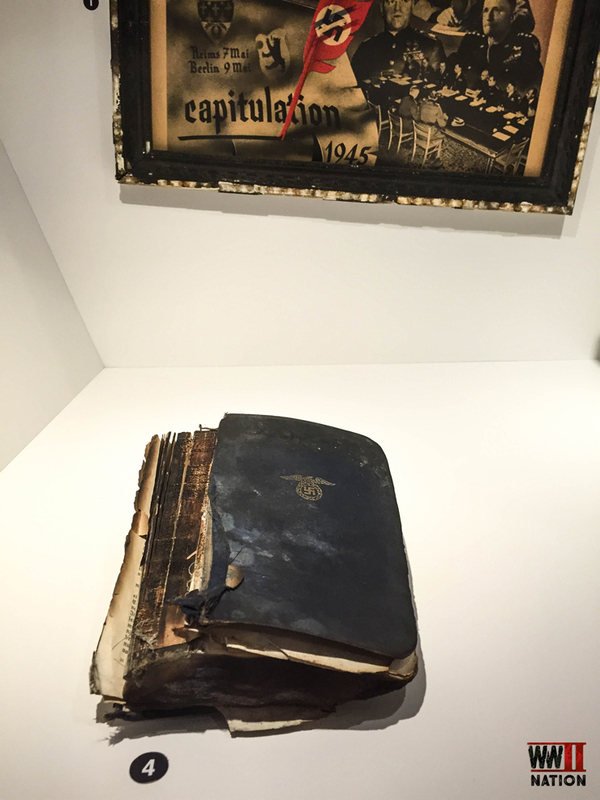 The museum starts with a brand new Mein Kampf presented to a German couple when they got married. It ends with a burned out and damaged copy of Mein Kampf that was found in 1945 at the end of the war in the ruins of the Berchtesgaden by Major Odon Carrette of the 3rd Ardennais Battalion, at that time a volunteer with the U.S. Army. 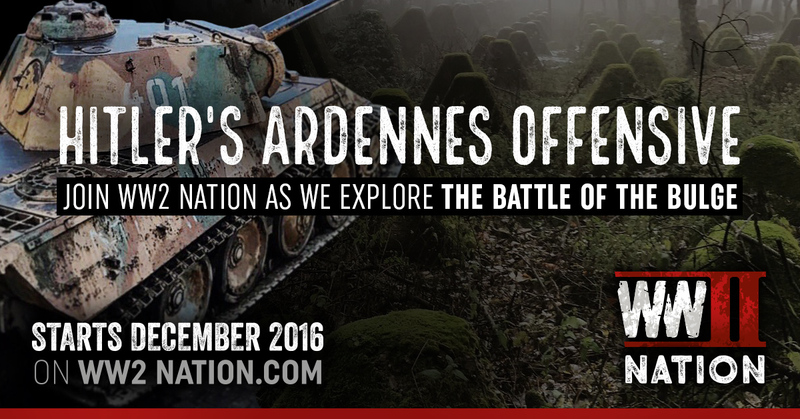 I hope you have enjoyed our photo reel highlights from our 5 Day trip Exploring the Ardennes. Thank you for reading. Also a big thank you to Martin for kindly showing us around the Bastogne War Museum. 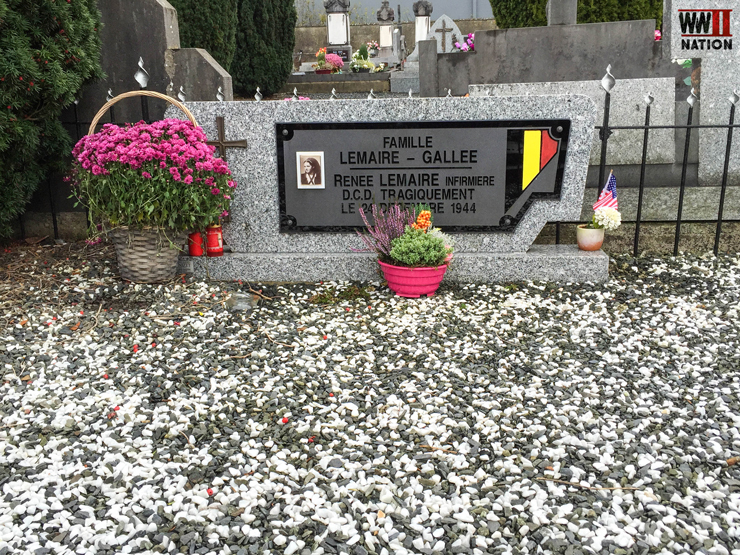 Our 4th Vlog from this trip which sees us follow the story of Renee Lemaire, the Angel of Bastogne will be out very shortly. If you wish to find out more about any of the places discussed in this post, please do feel free to get in contact with myself or Ross and also please do see below, as I have put together some useful links including to some archive footage and photos. I also highly recommend to anyone to take a read of Battlefield Guide Reg Jans article on the ‘Angel of Bastogne,’ which gives some amazing first hand testimonies of what happened at the aid station on the night of 24th December 1944. Link Below.